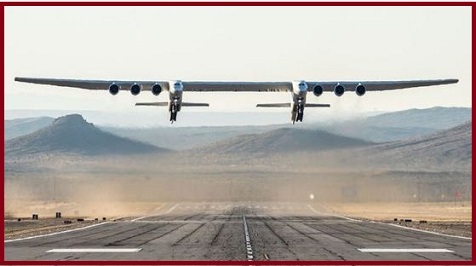 The world’s largest aircraft, developed by aerospace venture Stratolaunch has successfully completed its first flight test on 15th April 2019 at California's the Mojave Desert. The world’s largest aircraft has a dual fuselage design and a wingspan greater than the length of an American football field. The world’s largest aircraft achieved a maximum speed of 189 miles (302.4 km) per hour, the plane flew for 2.5 hours over the Mojave Desert at altitudes up to 17,000 feet. The world’s largest aircraft has a world-record wingspan of 385 feet and is 238 feet long. It is wider than any airplane on the planet. Stratolaunch aims to develop an air-launch system with three primary components: A carrier aircraft; A multi-stage payload “launch vehicle” which would be launched at high altitude into space from under the carrier aircraft and A mating and integration system.